The gleaming fitness center awaits. The secluded oceanfront spa cabana makes "real life" seem ever so far away. Spend hours lounging by the sparkling pool, with zero regrets. You'll know your family's made itself fully at home when you step on that first small Lego. Somehow everything tastes better under the rustling palms. 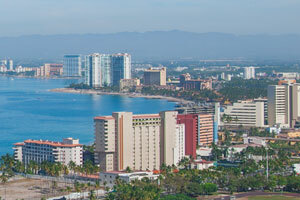 The Villa del Mar Beach Resort & Spa Puerto Vallarta is located in the heart of the buzzing Puerto Vallarta hotel zone. Take advantage of the available all-inclusive plans to take the hassle out of planning your vacation. Stop by your condo to drop off your luggage and get changed into swimsuits. Grab goggles and water wings before heading to the outdoor pool for a swim. Don’t forget the sunblock! The Bay Breeze Spa’s outdoor cabanas offer treatments inspired by the sea and give you the chance to take advantage of the near-perfect tropical climate (averaging three-hundred and twenty-two annual days of sunshine!). While the little ones are hanging out in the kid’s activity center, get in a workout at the well-equipped fitness center or a game on the tennis court. Studio condos sleep three guests and have kitchenettes. One- to two-bedroom condos sleep four to eight guests. Full kitchens have everything that you need to whip up anything from sandwiches to multi-course meals. Stop by the on-site convenience store/deli for groceries. Let the kids assist with baking your famous sugar cookies. Use the cookie cutters you brought from home to make the cookies into fun shapes. While the cookies are baking, watch a sitcom rerun on the Cable TV. Don’t feel like cooking dinner? No problem! The resort has three on-site high-end restaurants to choose from. All condos are air-conditioned and individually decorated. On-site laundry facilities allow you to save space in your suitcase. Shopaholics will love La Isla Shopping Village. It features a variety of shopping and dining options along with a movie theater. For apparel, there’s Tommy Hilfiger, Calvin Klein, Hurley and Guess. Other stores include Sunglass Hut, AT&T, Kiehl’s and Bath & Body Works. When it’s time for lunch head to Sbarro or Johnny Rockets. For dessert, check out Moyo Frozen Yogurt. Treat yourself to a latte or frappuccino at Starbucks. Daredevils will have a blast at Skydive Vallarta. They are a team of professional skydivers with over eighteen years of experience. They offer a Tandem Jump where you will be harnessed to your instructor and jump together. First, you fly to an altitude of ten-thousand feet above sea level. When you jump, you will experience a forty-five-second long free fall at one-hundred-twenty miles per hour. Once the parachute is activated, you will fly over the sea for approximately five to seven minutes before landing on the beach. All-inclusive room rates at Villa del Mar Beach Resort & Spa Puerto Vallarta are available. These rates are higher because they include onsite food and beverages in the room rate (some restrictions may apply). - All non-motorized water sports are included.